This Autumn we are challenging perceptions opera and invited Florian and Lydia to see Glyndebourne’s new production of Hamlet ahead of its visit to Plymouth. Initially, it did seem slightly surreal to be sat at Glyndebourne, somewhere near Brighton in the middle of nowhere, with fellow Lab Company member Lydia and James from Marketing at 4pm on a Tuesday afternoon, about to witness what can only be described as a world-class, truly epic opera, but all in a day’s work I suppose. Having started the day at the bitterly cold Plymouth Train Station, still paranoid about whether I’ve quite met the ‘smart-casual’ dress-code, swung by London on the way through, and finally made it all the way over Lewes and to our seats in the Red Upper Circle at Glyndebourne, it seemed as though we had almost embarked on, dare I say, an adventure. 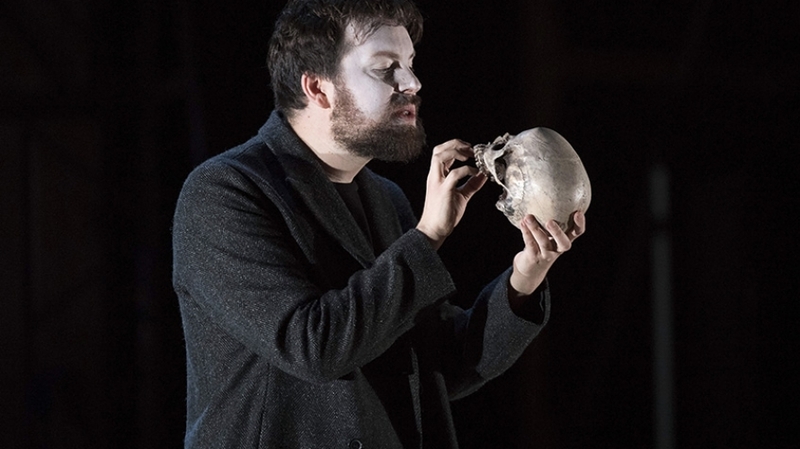 Upon arrival, we were taken to choir master, Nick Jenkins’ office, for a quick interview to tell us a little about Glyndebourne’s Hamlet and why it is a modern opera accessible for anyone. Lydia, being a true opera fan, fired some pertinent operatic questions, whilst I nodded intently in agreement before offering up some of my own slightly less informed, questions on Glyndebourne and their Hamlet. After a quick and slightly damp tour of the grounds, we made our way to our seats, ready for some Hamlet action. Now I can’t claim to be an opera-lover, my experience of it can only be described as limited; previously to this trip, I’d never seen any professional opera so it’s safe to say I went straight in at the top, which is certainly the best way to do it and I think I might have just been turned.